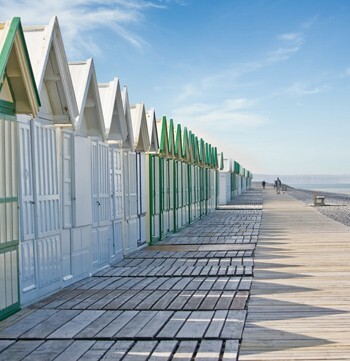 There is an overriding sense of holidays at Domaine du Val… A summer breeze that carries with it delights not to be missed: the Ludovic Dupont food truck and the beach hut, prettily named, “Bergeronnette printanière”, installed at Le Crotoy. This image of brightly-coloured beach huts lined up along the beaches of the North Sea, is maybe one that you are familiar with. Maybe you have already been slightly envious of holiday-makers spending their time here, absorbed in conversation, topping up their suntans and looking bathers up and down as they go past. Perhaps when you were little, you used to dream of joining the very close-knit club of people who used beach huts to change their clothes modestly, out of the public gaze. Well, now is the time for your dreams to become reality! Another exclusive pleasure for the summer: Ludovic Dupont’s food-truck will come round every Tuesday evening. How about enjoying really good food without having to leave Domaine du Val? What a luxury to try some tasty, top quality dishes that are healthy too! In fact, Ludovic Dupont, a former cookery advisor at the Jardins de Valloires and Cap Hornu as well as being a plant specialist, gives a very special place to plants and their flowers, even including in his cooking plants that many people would consider to be “weeds”. Those who love unusual and hitherto unknown flavours and ultra-fresh food will be bowled over! This exceptional cuisine is based on the principle of “straight from the garden to the plate”. Produce from the Baie de Somme is given pride of place; the result is both surprising and delicious! Dishes to try out include Avocette flour bread with a nettle sausage and onion confit with sea buckthorn; or ice cream made from flowers… Come and meet this travelling chef, whose signature cuisine is exceptional and who loves talking about his job. He is at Domaine du Val every Tuesday evening during July and August.